2017 was a record year for wildfires in British Columbia, which is nothing to cheer about. The raw numbers are staggering in and of themselves: 1,200,000 hectares burned, and tens of thousands of people evacuated from communities across central B.C. In an unprecedented action, the province of B.C. declared a provincial state of emergency that was in effect from July 7 through September 15. B.C. is divided into six geographical regions: Coastal (southwest B.C., metro Vancouver and Vancouver Island), Northwest, Prince George (northeast B.C. ), Kamloops, Southeast B.C. and Cariboo. 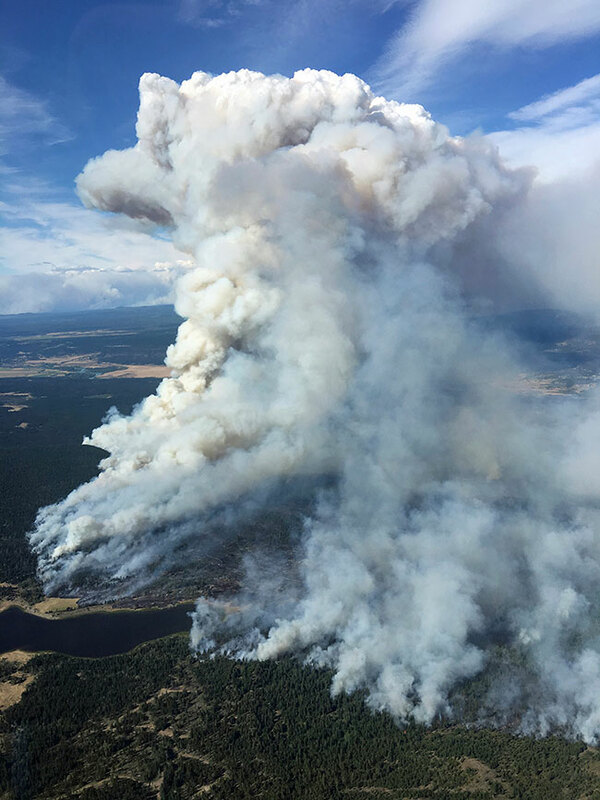 The Coast and Northwest regions had light years, while the Cariboo region was home to almost 72 per cent of the total burned, with the Plateau Fire responsible for 545,000 hectares. 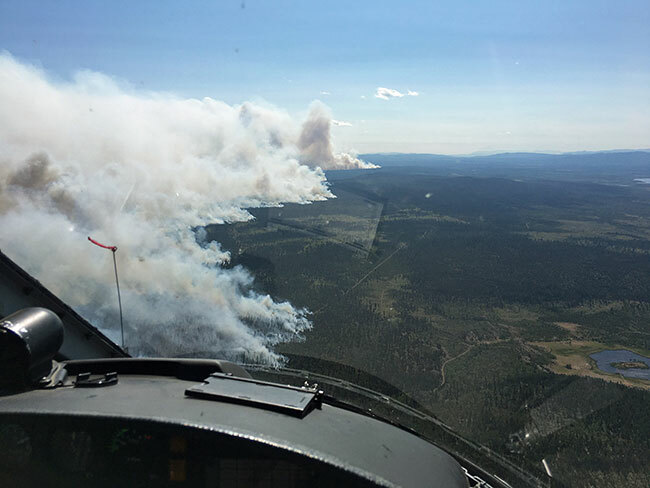 Colin Pelton of Talon Helicopters spent the summer out on the Chilcotin Plateau, working on and around some of the largest fires of the summer. His firefighting season started in High Level, Alta., 1,075 kilometres from his home base in Vancouver. July 6 and 7 were the days the fire tsunami reared its head across the Chilcotin Plateau west of Williams Lake. Over those two days, 140 new fires were reported across the province, most of them in the Cariboo region. On the afternoon of July 7, Colin Pelton was sitting at the Williams Lake airport, in his words, “enjoying the airshow” as aerial tankers shuttled through the tanker base, reloading and heading off to fires in the region. The storm forced him to take a circuitous route to pick up the initial attack crew he had been dispatched for. As he flew, he made note of the spot fires caused by dry lighting, but lost count after reaching 30. By the time he reached his crew and they loaded up, an hour had passed. In that hour, the magnitude of the situation was clearly written. The IFR is an assessment of the size of the fire, the fire rank (Rank 1: “smoldering” to Rank 6: “blow up”), fuel types and “values at risk” (immediately threatened life, property, timber resources and other special values), as well as potential water sources and road access. The next morning, July 8, started with more of the same, but with an expanded area of operation. “We were doing tactical evacuations, landing in people’s yards and telling them to pack up and either leave now or be ready to leave.” The challenge was that that even when evacuation orders were issued across the region, few people left. Ranchers don’t want to leave their animals and many people, especially the local First Nations people, are intent on protecting their way of life. The place names – Hanceville, Lee’s Corners, Alexis Creek – that dot Highway 20, which stretches across the Chilcotin from Williams Lake to Bella Coola on the coast, are reflective of the first Europeans to settle in the region in the later years of the 1800s. First Nations people have lived in the area for thousands of years and living with wildfires has been part of their way of life since the very beginning. Fires have burned across the Chilcotin plateau since the last ice age. The region is a mix of timber and open grasslands. The trees aren’t the giant conifers of the coast but a mix of pines, spruce and fir. The pine beetle infestations over recent decades have left large areas of standing dead timber. Combined with a period of extended drought, high temperatures and strong prevailing winds, the dry lightning of July 6 and 7 touched off a firestorm. Those initial fires that Pelton and his IA crew had plotted grew into major fires. 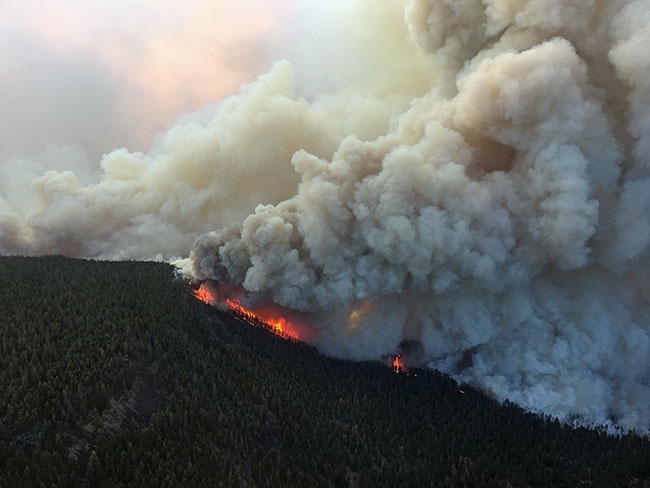 Then, through a combination of topography, fuel load and wind, the fires began running towards each other at a rate previously unseen in B.C., merging into the monster fires that appeared unstoppable. 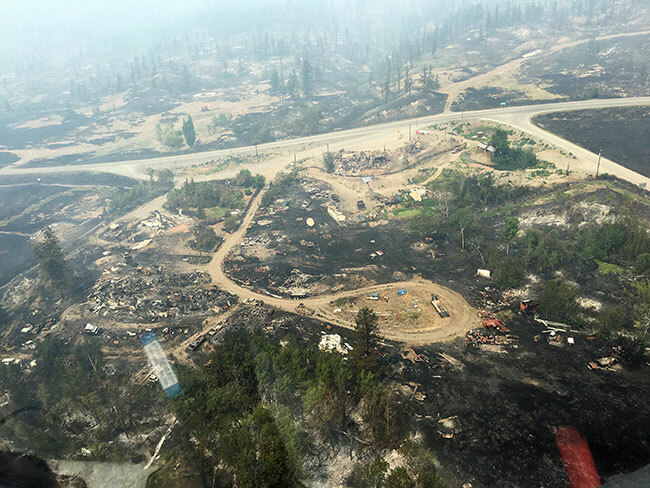 After starting on what became known as the Hanceville Fire (which grew to 240,000 hectares), Pelton and his AStar were moved about 40 kilometres west along Highway 20 to what initially was the Chezakut Fire on the north side of Puntzi Lake. That fire became one of the 20 fires that merged into the Plateau Fire, as it became known, eventually covering 545,000 hectares. At the best of times, communication is a huge challenge across the region. There is no cell phone coverage between Williams Lake and Bella Coola. The wireline phone system was disabled by the fires, as was the electrical infrastructure across the region. It was an “interesting” situation to be in, as Pelton recalls. By the time he was moved up onto the Plateau Fire, the radio traffic was unlike anything Pelton had experienced. While it was isolated being out on the plateau, there was a huge advantage to having the wind on their side, he said. While the west side was relatively clear, Pelton spoke with pilots who were flying on the east side of the fires — they were constantly dealing with smoke. Smoke from the fires spread across much of Alberta, the rest of British Columbia and down the Pacific Coast as far as Oregon, triggering public health advisories. Into September, as the fires were finally losing their momentum, Pelton continued scanning for hotspots and knocking them down. The last couple of days were spent patrolling the perimeters and then on Sept. 15 it was all over for Colin Pelton and Talon. “It snowed, we were released, and I went home. It all came to a grinding halt,” he said. Seventy-five days at work on the fires — the same start and finish as the provincial state of emergency. “Moving forward, the types of warm, dry, windy conditions that we saw this summer are projected to become more and more common because of climate change. With our forests in their current state, we will become susceptible year after year to wildfires,” said Lori Daniels, a professor of forest and conservation sciences at the University of British Columbia and one of the authors of the letter. The provincial government has since initiated an independent review of the 2017 fire season, with the report due in April 2018.